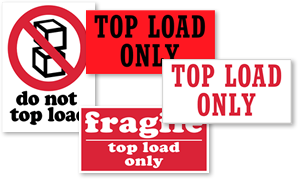 Make sure a small or fragile box doesn't get crushed by something much heavier in freight. Mark with a Top Load Only Label to make sure it gets extra consideration. Easily instruct handler of special requirements with bold messages in a striking red to prevent damage in transit. • In several sizes and designs, with 500 on each roll. • Choose from standard or fluorescent paper, for high visibility. • Unlike handwritten instructions, our shipping labels give your package a professional look.